In honor of Thanksgiving, here are five facts about the big bird at the center of the table. 1 Turkeys are getting bigger. As recently as 1980, the typical U.S. domesticated turkey weighed less than 19 pounds at slaughter — not much bigger than its wild cousin. But modern methods of poultry farming enable turkeys to put on more weight more quickly: The average turkey slaughtered last year weighed 29.8 pounds, more than twice the average weight 75 years ago, according to data from the National Agricultural Statistics Service. The result: Turkey farmers can produce more meat (nearly 5.8 billion pounds this year) from fewer birds (a projected 242 million). 2 Minnesota and North Carolina are the nation’s leading turkey-growing states, last year producing 46 million and 36 million birds respectively, according to the Agriculture Department. This year, the 13 biggest turkey states are expected to collectively produce more than 85% of the nation’s birds. 3 Turkeys, at least the frozen kind, are cheapest this time of year. From 2000 to 2012, the per-pound price for a whole frozen turkey fell an average of 9.5% from October to November, according to the Bureau of Labor Statistics (which collects price data on hundreds of items, including turkey, so it can calculate the Consumer Price Index). Prices typically stay low in December before rising again after the holidays. 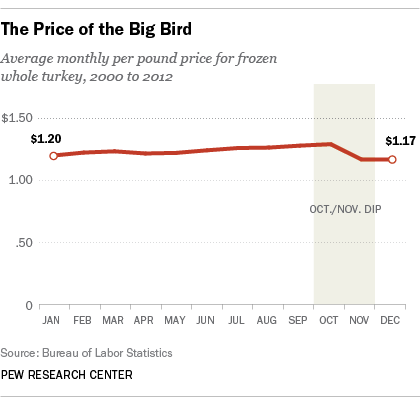 This might seem counterintuitive — shouldn’t turkeys be most expensive when demand is highest? — but as New York Times writer Catherine Rampell explained recently, the phenomenon isn’t unique to holiday turkeys, and economists have offered several hypotheses to explain it. 4 Americans like their turkey, but their appetite has limits. 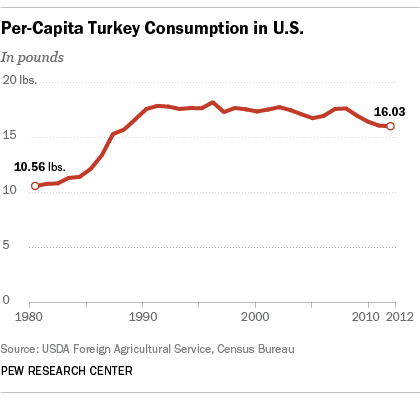 After rising rapidly in the 1980s, per-capita turkey consumption leveled off at nearly 18 pounds per year, but more recently has been drifting lower. 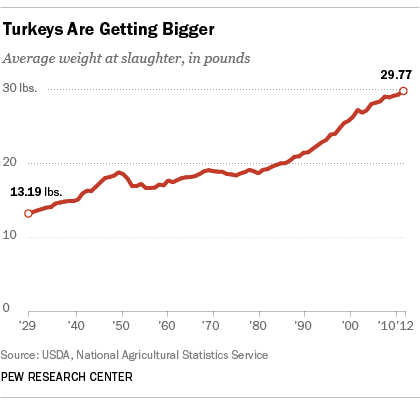 Last year, according to Agriculture Department data, Americans ate an average of 16.03 pounds of turkey. At this year’s projected consumption level (5.06 billion pounds), per-capita consumption likely will be about the same or a bit lower than 2012. 5 More U.S. turkey is heading overseas. 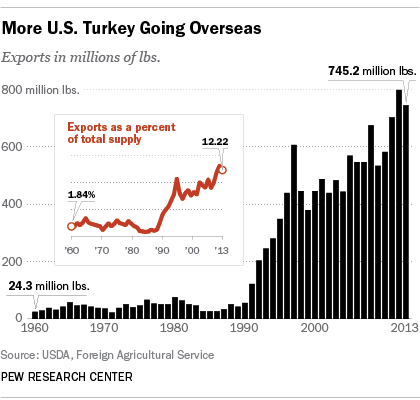 Turkey exports began rising sharply in the early 1990s, and are expected to account for 12.2% of this year’s total U.S. supply. Mexico is by far the biggest market for U.S. turkey, importing 412.7 million pounds last year, according to the National Turkey Federation; Canada (31.2 million pounds) and Hong Kong (26.6 million pounds) were in second- and third- place.